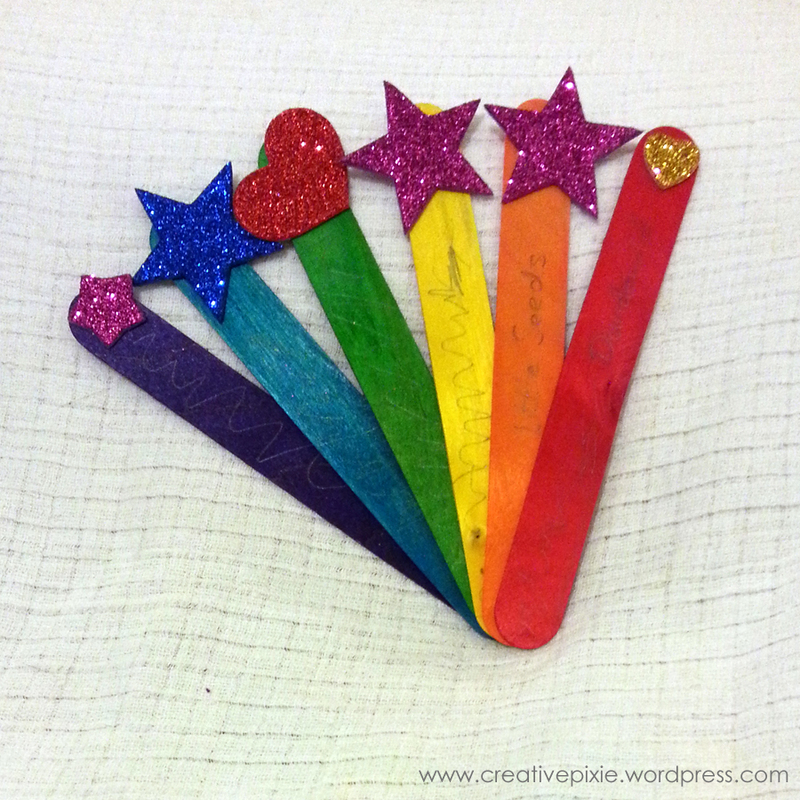 This weeks make is one that Mr Pixie did with our girls. 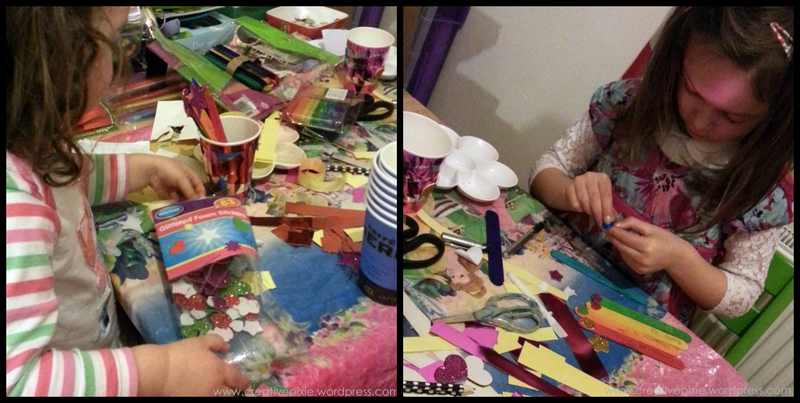 We are leaders in our church creche and for a weekend this month our church is taking part in a 24/7 prayer chain. This is part of a global initiative from 24-7 Prayer , there are currently 108 prayer chains taking place in 25 countries. 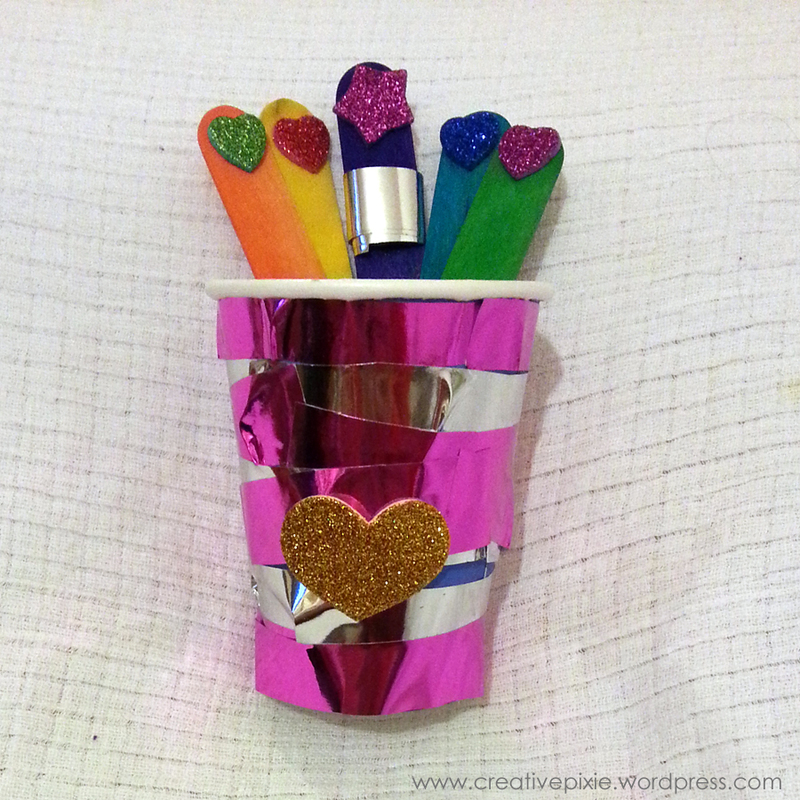 To prepare our little preschoolers for this Mr Pixie wanted to make some prayer pots with the children (Miss P had done something similar with her Rainbows group) so our Miss P and Miss E were the guinea pigs. The finished pots contain sticks on which prayer points are written, the child can pick out a stick and pray for whatever is written on the stick. 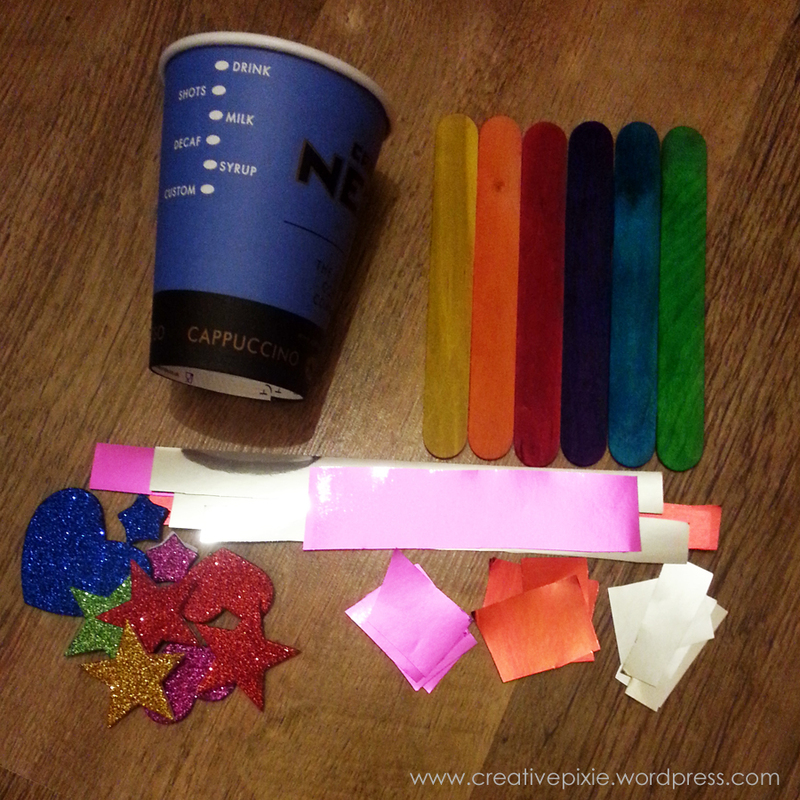 The materials required are: a disposable cup, coloured jumbo lolly sticks, glittery foam shapes, self adhesive foil paper, scissors and a pen. 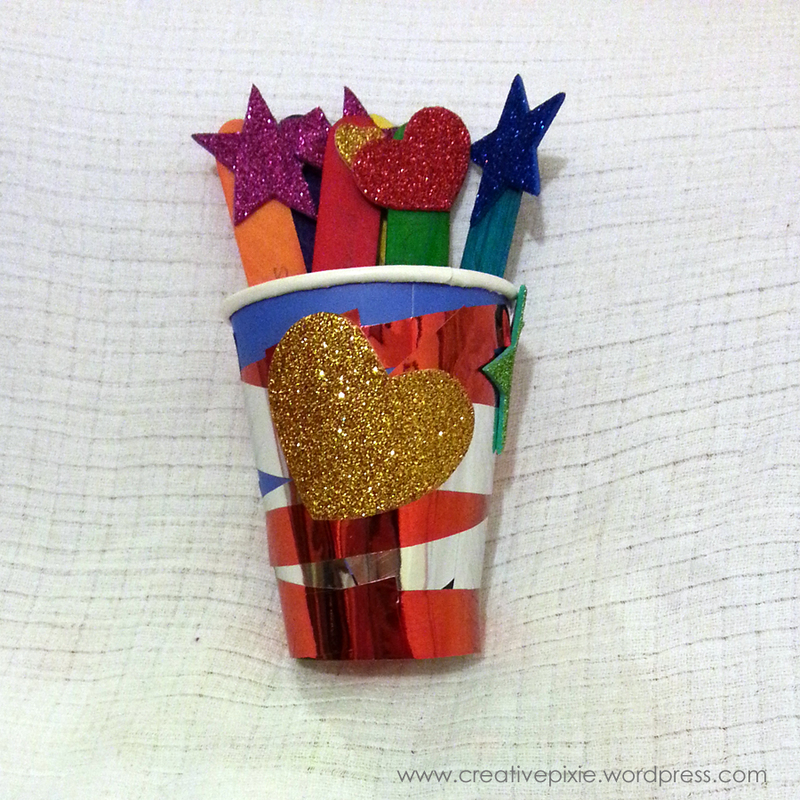 The cup can be decorated however you choose with the paper and foam shapes (self adhesive paper and paper rules out the need for PVA glue – bonus!). Here’s my girls decorating their pots and sticks. I just love these coloured sticks, the colours are so vibrant. I’ll have to think up another project for them as they came in a pack of 100! This was a great make for keeping little hands busy and well done to Mr Pixie for organising it. Great idea. Colourful and appealing. Cool to see a dad being all crafty with is girls! Great idea too. Thanks, he is very good with his girls. He asked me to include his activity on a Make it Monday post – so he may have more makes up his sleeve. Jean, such a wonderful idea!! and the sticks are like a rainbow, which I say ‘a rainbow is the promise of God”….so these prayers will definitely be heard and answered. Thanks Marianne, I’ll pass on your lovely comments to my husband. Looks like great fun! So colourful! Lovely idea as well. Thanks, I’ll pass on your comments. The coloured sticks look even better in real life so it’d be great if I could think up another project using them.